The great changes in international relations in recent years have been reflected in equally dramatic developments in the United Nations, requiring a re-evaluation of its role within the international system. The reinvigoration of the Security Council and the innovatory techniques it has deployed in the maintainance of international peace and security have raised a host of issues for a 'decentralised' international community. Amongst the most fundamental questions are those relating to the constitutional order which the United Nations is obliged to uphold and by which it is itself governed. 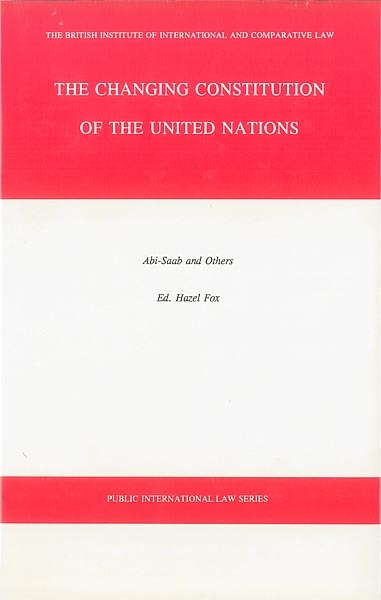 In this book some of the world's leading commentators on international law analyse these new developments, giving their own perspectives on the core issues which are raised by the United Nations now playing the central role in international peace and security which was advocated for so long and which is now so much closer to reality. The full price for this book when not purchased via the website is: Members £39 Non-Members £65.